You can manually download this week’s gore-tastic podcast here, or subscribe to the show via the iTunes store. To manually subscribe, use this link in the device / podcast player of choice. You can also follow us on Twitter, or ‘like’ us on Facebook. Want to have an email or comment read on the air? Send us a message on the ole Twitter or Facebook, or, shoot that mail to parentsbasementpodcast@gmail.com. 49:30 – Emails. Todd explains his absence from last week, and the guys talk scary vidya game experiences. 1:05:00 – The return of the ToddBitSkit! – There are plenty of good videos on Smash TV on the Internets! Here’s a speedrun in 28 minutes, and a longer play of more than an hour. – According to Price Charting, Super Smash TV is about $16 for the loose cart. If you want the manual and box, the price shoots up to $40, and new or perfect condition copies run $115 currently. There are also inferior home versions available for the NES, Game Gear and Genesis, all of which run for $6 to $8. 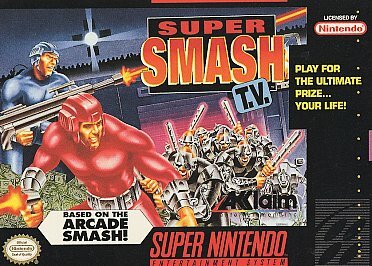 – As mentioned on the show, Smash TV used to be available on the online stores, but it was taken down after Midway went bankrupt and got sold in 2010. It is available in Midway Arcade Origins, a compilation disc for the PS3 and 360 released in 2012. Although some of the games in that collection have iffy controls, Smash TV is still pretty solid. It’s available used for about $10, new for $20. – The “sequel” to Smash TV is called Total Carnage, although it’s more of a spiritual successor as opposed to a straight continuation. It’s not nearly as well-reviewed or popular though.